Receive a 12-month mentoring e-course to help you build a survival foundation with practical tips, frugal preps, and common sense. ​Simply pay attention to the news and you will see that it is not like the stable and predictable world of our parents and grandparents. The secret not many know is that you really CAN be ready for these events, physically and mentally. 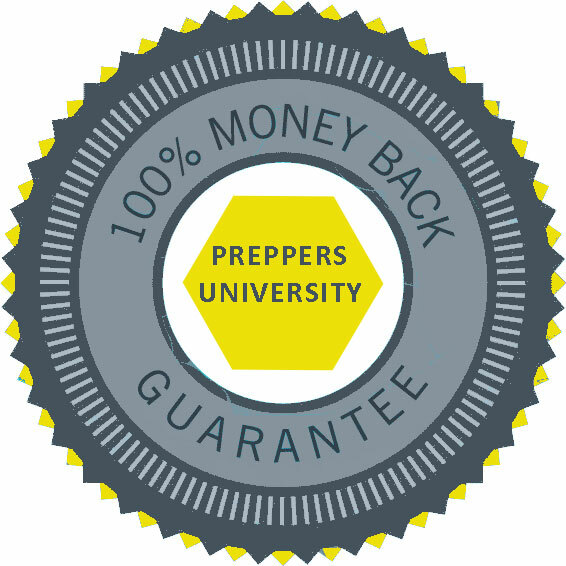 Preppers University is here to help you reach that level of preparedness, and go from fearful to confident and bold. You'll know just what to do in a crisis, and few can say that with certainty. Sign up for email updates and get a valuable, but FREE preparedness planner. Join the Preppers University community, and get to know us! Ask questions, get advice, and learn about new classes and offers. ​Learn from some of the top experts in the field of preparedness and survival, from your home. Select the class topics that are most important, most relevant to you and your family. Buy one module, buy them all. The course selection is completely customizable, and you're in charge. Once purchased, you have lifetime access to all course materials. ​Author and EMP expert, Arthur T. Bradley teaches the finer points of Faraday cages and best strategies for preparing for a grid-down future. ​The Survival Mom, Lisa Bedford, whose best-selling family survival manual is a classic for homes and families. ​Survivor of Argentina's economic collapses, author Fernando Aguirre (FerFAL) explains the signs of an economy teetering on the edge of collapse and how to prepare for that event. ​Off-grid lifestyle expert, Tammy Trayer, teaches the nuts and bolts of living off the power grid and provides details for setting up your own alternative energy system. Imagine getting prepared for natural disasters, major personal crises, extreme weather events, and even worst-case scenarios, all in the comfort of your home, which makes sense - it's your home and family you are working to prepare. ​You can be among the first to know when each new class is released. Preppers University has changed the world of preparedness by connecting ​experts directly with you IN YOUR HOME! Founded by Lisa Bedford of The Survival Mom blog and fame, Preppers University is a unique and interactive online school designed for the everyday person who sees a chaotic world and desires to build a home and lifestyle strong enough to withstand the crises that are a part of life. In other words, we designed everything about our courses with you in mind. With lifetime access to all recorded webinars and instructional materials, you'll be able to progress through the curriculum with others, via scheduled online discussions, work at your own pace, or a combination of the two. You might even want to bring along a friend and work through the class together. Our goal is to help you get prepped — not tie you down to a rigid schedule. Grab a cup of hot tea or coffee, relax in a comfortable easy chair, and dig into this new, online learning that can change your family's life. ​I have felt very alone in my preparedness journey as it has been just me looking up information on Facebook or Pinterest, or following a couple of blogs. This class provided a community of like-minded individuals who I was able to relate to, understood my concerns, and offered helpful advice to my questions. I am very appreciative of this wonderful class, and am very thankful to my fellow classmates who I also learned a lot from. Thanks for coming up with the idea of the Prepping Intensive. A super idea! One of the things that I like the most is that you are so reasonable about what real, average people will actually get accomplished. ​Who will benefit from Preppers University? You never thought about prepping until just recently and need hand-in-hand support to get going. ​You were once off to a good start but became distracted and need new ideas, encouragement, and maybe even accountability. ​You are looking to network with other like-minded people and learn the skills necessary for long-term sustainability, such as how to set up barter systems and prepper communities. ​While we can't guarantee our educational modules will deliver a yoga level of zen and calm, we can promise they will meet you at your level of preparedness, not too difficult, not too simple, and since you'll be able to choose the modules most helpful to you, well, maybe you will feel a new level of peace and calm! ​We know that the internet is bursting with survival and prepping information, opinions, advice, and high-pressure sales websites. That isn't us. Our goal is to work closely with you, providing supportive online education that will enable you to create the prepared home you desire. If you have questions, we're reading to answer them. Just shoot us an email at this link. This class comes with The ​Prepper's University guarantee. Once you take the course, if it didn't live up to your expectations, simply request a full refund. No questions asked.